Central Park is on everyone's must-see list when visiting New York City. It's not just an oasis of green within this busy city, it's a place to go for art, music, entertainment, and even boating on the lake. The design for the park was conceived by Frederick Law Olmstead and Calvert Vaux in 1857, who submitted their plan for Central Park during a contest organized by the Central Park Commission. When Central Park first opened in the winter of 1859, it was the first artificially landscaped park in the United States. With 843 acres of land, Central Park offers top-notch entertainment like Shakespeare in the Park as well as fun things for children like carousel rides and a children's zoo. Central Park has had a carousel since 1871 when it was powered by a horse and mule. It is said that the live mule or a horse was hidden beneath the carousel and would stop and start when the operator tapped on the wooden floor. Today's carousel has been there since 1950 and was originally built for a trolley terminal outside of Coney Island, before being moved to Central Park. The Central Park Carousel is entirely hand carved and hand painted and features the largest hand-carved figures ever made. Rides on the Central Park are $3 each (cash only) for both adults and children. The Central Park Carousel is located mid-park at approximately 65th Street and Sixth Avenue. If the size of Central Park seems overwhelming, consider a walking tour. The Central Park Conservancy offers free walking tours. The tours last one to one-and-a-half hours, and they have over ten different walks available. For movie buffs, you can take a movie tour of Central Park locations where movies were filmed. 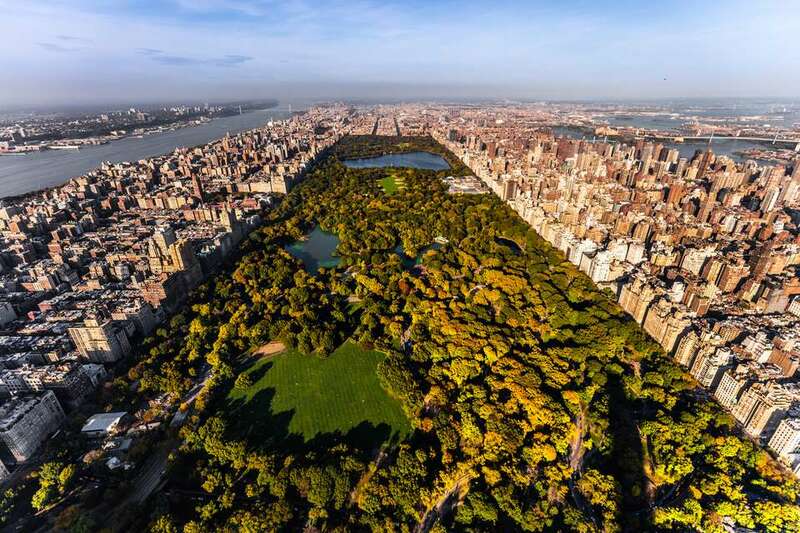 History buffs will enjoy taking Big Onion's Central Park Walking Tour lasting approximately two hours and covering between one and two miles or take a tour using the valuable New York Sightseeing Pass. Those who don't want to walk might try a Pedicab Tour. If you want to spend the afternoon feeling like a "real" New Yorker, consider enjoying a picnic in Central Park. First, you can shop for picnic provisions at a great New York City market and then you can relax and people-watch while you enjoy delicious food and drink. On sunny days, people flock to the park to sunbathe. Bring your picnic lunch and sunscreen and join in. Sheep Meadow and the Great Lawn are two popular places to picnic and people-watch, but you can wander around and find a place that appeals to you, lay out your blanket, and have a marvelous picnic. Head to Loeb Boathouse and you can rent a boat to row around the Lake, Central Park's second largest body of water (only The Reservoir is bigger). Boat rentals are charged in 15-minute increments and require a cash deposit. Boats are available for rent from April through November, weather permitting. Each rowboat can hold up to four passengers. If you're looking for something more indulgent, gondola rides are available but you'll need to reserve in advance. Boating is a way to get a closer view of waterfowl that are hard to see from the shore, including the park's famous egrets, herons, and loons. Throughout the summer, Central Park hosts many musical events, ranging from popular to classical music. Outdoor venues offer music in a relaxing natural setting. An online calendar of events includes concerts and performances. The Conservatory Water was inspired by a model boat pond in Paris. Even if you don't have a model boat of your own, you can rent one or join the crowd of observers enjoying the model ​sailboats on the Conservatory Water on Central Park's east side from 72nd to 75th Streets. Conservatory Water holds its boating season from April to October each year. Races are held on Saturdays, beginning around 10:00 am. Nearby, you can also check out the Alice in Wonderland Sculpture or do a little birdwatching. For over 50 years, audiences have been enjoying free performances as part of Shakespeare in the Park, held at the Delacorte Theater in Central Park. Each summer schedule typically features two different productions, but not all productions are Shakespeare's plays. You'll need to line-up or try your luck at the online lottery for free tickets to same-day performances. Alternatively, you can become a Summer Sponsor, where your tax-deductible contribution ​lets you skip waiting in line for same-day performances. With 843 acres to explore, Central Park is a wonderful place for aimless wandering. Wear comfy shoes, bring a map and enjoy Olmstead and Vaux's beautifully designed park. Take time to enjoy both the intensely manicured areas of Central Park, as well as the wilder places, like The Ramble, the lush woodland area of the park. Central Park is dog-friendly, so if you are visiting with your best friend, the park is the place to go. Most areas require that you leash your dog although there are times and locations for off-leash romping. There's nothing more romantic or traditional as a horse-drawn carriage ride through Central Park. You can take a carriage tour or even arrange to pop the question as you ride through the park. You can find the carriages all year round lined up along Central Park South between 5th and 6th Avenues. There are some restrictions, like outdoor temperature limits, to protect the horses. Carriages hold four people. At the Central Park Zoo, you can feed the penguins, visit the children's zoo housing the only cow in Manhattan, or check out the playful sea lions. Just a few steps from Fifth Avenue, you’ll find over 130 different species ranging from Snow Leopards to colorful tropical birds. The zoo covers over five acres and is divided into habitats. You can purchase your tickets using your smartphone for instant access. The Hallet Nature Sanctuary can be found at the southeast corner of Central Park. This four-acre woodland is a peaceful place to go to get away from some of the park's busy paths. Enter at Sixth Avenue and Central Park South. Hallett Nature Sanctuary is one of the Park's three woodlands (along with the Ramble and North Woods). You can explore the sanctuary with Central Park Conservancy guides on a 90-minute Tour. Dogs are not permitted in the sanctuary. In a tranquil section of Central Park, on the West Side between 71st and 74th Streets, you'll find a living memorial to the world-famous singer, songwriter and peace activist, Beatle John Lennon. When Lennon lived nearby he enjoyed this peaceful area. This part of the park was named after one of Lennon's favorite songs, "Strawberry Fields Forever." The song's title comes from an orphanage in Liverpool, England where Lennon used to go to play with the children, much to his mother's dismay. You'll find a round mosaic which was given as a gift by the city of Naples. It bears the word of another of Lennon's songs: Imagine. This spot, with benches shaded by trees, is designated a Quiet Zone and is ideal for mediation.